Thirty-three miners are trapped in this mine in Copiapo, Chile. What is it like to be trapped underground for weeks, if not months? That's the prospect faced by 33 men discovered alive on Sunday, 17 days after the Chilean mine they were working in collapsed. Their initial shelter was just 530 square feet — the size of some studio apartments — but they have since spread out into a tunnel. Due to the danger of drilling close to the miners, it could take up to four months to reach them — raising the question of how the trapped men will cope. Below are some perspectives from mine safety experts, two Australian miners who in 2006 survived being trapped for two weeks and one of the trapped Chilean miners who was able to get a note out to his wife. "We need to urgently establish what psychological situation" the miners are in, Chilean Health Minister Jaime Manalich said Monday in announcing the arrival of doctors and psychiatrists. They "need to understand what we know up here at the surface, that it will take many weeks for them to reach the light." Key to their well-being will be to keep them busy and well-supported, Manalich said. "There has to be leadership established, and to support them and prepare them for what's coming, which is no small thing." Kathleen Kowalski Trakofler, a research psychologist at the National Institute for Occupational Safety and Health, says that while research in this area is limited, there may be some general behavioral responses. "Over time, individuals are likely to feel crowded, sleep-deprived, irritable, bored, and restless," she says. "Other noxious stimuli include loss of privacy while toileting, odors ... as well as absence or presence of noise by any operating machinery or life support systems. Low levels or lack of lighting provides no normal cycling of light to trigger the body’s natural circadian rhythms." "Common symptoms," she adds, "include anxiety, withdrawal, aggression, hostility, depression and irrational and impulsive behavior." Australian Todd Russell has first-hand experience coping in such a situation. In 2006 he and a fellow miner survived two weeks trapped in a safety cage 3,000 feet below the surface. The two were feared dead until a thermal imaging camera spotted them five days after they were trapped. A third miner died. Russell told London's The Guardian newspaper that he and fellow miner Brant Webb "hoped that what they did on the outside wouldn't kill us. We knew that the guys were working their way towards us. We could hear everything that was happening outside us and we could hear the underground machinery operating." "Brant and I relied on each other's strengths," he added. "We made up stories and sang songs just to take our mind off things and tried to put our minds into a positive state." "We also cried," he told the BBC World Service. A big concern is that over time the "euphoria" of being found will give way to the miners starting to say, "OK boys, let's get this thing over with," says Davitt McAteer, who was assistant secretary for mine safety and health at the U.S. Labor Department under President Bill Clinton. A narrow shaft is being used to deliver food and medication to the miners, and is allowing communication with relatives via microphones and letters. But health officials are worried about the heat below and loss of body weight among the men. A TV camera lowered down the bore-hole showed that some miners had removed their shirts because of the heat and lack of air. In a radio communication with Chile's mining minister Monday, the miners said "they had eyes irritated by the dust, that they needed tooth brushes, and that one of them had a stomach ache." Officials fear the miners might have already lost up to 20 pounds each, and Chile's Health Ministry is asking NASA, due to its experience with astronauts in remote and reduced quarters, for advice on what kind of nutrition to provide. Russell told the BBC that "it's amazing what your body can do. ... We survived on hope and courage, and each other, (and) we were lucky enough to have a bit of underground mine water." The miners so far have used the batteries of two trucks to power lights and charge their helmet lamps. Those details came from miner Mario Gomez, who scrawled notes on paper and tied it to the drill probe after it broke through their chamber. Gomez, 63, said the men also had used a backhoe to get underground water. It was unclear whether their air supply was in danger of running out. Russell, the Australian miner, described to The Guardian how he and his partner survived. "We were stuck ... in a small pocket of air. We couldn't stand up or even sit up. We had to lie down on our backs. If one of us was on our back, the other had to lie on his side for 14 days. We were tossing and turning on sharp rocks and being cut to pieces. We were really worried about the cuts getting infected. "We had no food or water for the first six days. ... We had to urinate into our helmets so we could collect something to drink." "It was also very hot and humid down there but, because of the flow-through of air from fans that were blowing through into the level we were on, we were also suffering from hypothermia (because of the cold air blowing on our sweat). We had to cuddle each other to keep our body cores warm." Chilean officials expect the rescue to take up to four months. "Miners have been rescued after over three weeks ... but four months would be a record," said Dave Feickert, an internationally recognized consultant on mine safety issues. "The psychology of such a situation is therefore not well known, but this group appears to have good leadership and they seem physically well." Two key factors are likely to be heat stress and how the miners organize themselves, he said. "They will need to stay active and organize each day to try to mimic their normal lives. Communication (including video links) with the rescue team and their families will be very important." "Generally speaking, miners survive underground on a daily basis because they know how to work in teams and are trained and experienced," said Feickert. "If the conditions are tolerable, they could become a bit like the crew of a nuclear sub, living under the ocean for months." Webb, the Australian miner, told the Sydney Morning Herald that contact with relatives was crucial. "The mental rollercoaster they are on is huge and without getting reassurance, without getting words from your loved ones, your mental and physical state goes downhill," he said. McAteer urged officials to keep the miners busy — not just communicating with relatives but also providing videos and even computer games. Gomez, the trapped miner, addressed part of his letter to his wife, saying that "even if we have to wait months to communicate ... I want to tell everyone that I'm good and we'll surely come out OK."
"Patience and faith," he wrote. "God is great and the help of my God is going to make it possible to leave this mine alive." Gomez's wife told reporters she looked forward to exchanging letters with her husband. "Can you imagine? After 30 years of marriage we will start sending each other love letters again," she said, giggling despite being exhausted after camping out in a plastic tent near the mine. "We were never confident that they were going to get us out alive. We just had to rely on each other and keep positive," Russell told The Guardian. "That's probably the best thing those miners in Chile can do to keep themselves alive. They should think of their families and loved ones and rely on their mates around them to get them through." What about after a rescue? "I personally don't think the miners in Chile will recover from this," Russell said. "We will never recover from our experience either. ... You've always got the constant memory with you for the whole of your life. It's going to be very hard for those guys and also their families because the families don't know from day to day whether their loved ones are going to survive the four months or whether they're going to perish where they are." Kowalski Trakofler, the research psychologist, says a dramatic change is not unlikely. "For people who are directly exposed to a disaster, acute post-traumatic reactions are not unusual and would tend to emerge early on," she says. "These reactions can include hyper-vigilance, difficulty sleeping and nightmares, feelings of anxiety, event-specific fears, anger or rage, and vulnerability. In a review and study of behavior associated with underground coal mine fires, NIOSH researchers found similar response symptoms. Recovery can be rapid for most, slower for others or, for some, may not occur at all." The strategy being used is to drill a tunnel through solid rock that's wide enough for the men to escape through. "This rescue technique was used at the Quecreek mine accident in the U.S. in 2002, but there the men were rescued after a few days," Feickert notes. 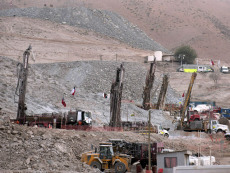 "The problems they will have in Chile include the depth of the chamber where the men are and the instability of ground. So the rescuers need to be careful in ensuring the integrity of the rescue shaft, through which a cylinder holding one man at a time must pass." McAteer is hopeful that since the mine is hardrock it's less likely to rumble as the drill comes through. On the other hand, he says, "you don't want to create any more problems than already exist." MATT LAUER, co-host: But we want to begin on a Monday morning with this miracle in Chile , 33 workers found alive more than two weeks after a cave-in at a small gold and copper mine . Carl Quintanilla has more on this. Carl , good morning. LAUER: All right, Carl Quintanilla with great news this morning. Carl , thanks very much. It's four minutes after the hour. Here's Ann.